Want to throw a party to impress your friends without denting your savings? Try making your own party favors for guests. Many homemade favors are simple, inexpensive and unique. You’ll leave your friends guessing how you learned to be so crafty! Using recycled materials means you don’t have to make a special trip to the store to buy supplies, in addition to keeping the cost low. If you have an infant, you probably have recycled many small glass jars. These are a great basic supply with many uses. They can be easily decorated with paper, ribbons, sequins and other art supplies to match any occasion and filled with candy or nuts. You can wrap them in fabric remnants or glue colored tissue paper to the outside to create tea light candle holders. When decorated with a winter theme, they also work well for individual servings of hot chocolate or instant coffee. The options are endless if you get creative, use a variety of materials and match the decoration to the occasion. You may even want to personalize favors with each guest’s name using letters cut out from magazines. In most American households, waste paper abounds. The Japanese art of paper folding, origami, gives thousands of ways to use paper to make almost any shape imaginable, even fold into tiny gift boxes. Newspaper is easy to fold and makes an elegant black-and-white palette, while magazine pages make each piece colorful and unique. For a truly eco-friendly party, give the gift of plant life. Giving seeds is an inexpensive and practical party favor that will grow and remind guests of the good time long after the party is over. You’ll need about a teaspoon of seeds if packaged in a small paper envelope, or more if wrapping seeds in fabric and tying with ribbon. Consider the climate of your area and the time of year, and be sure to include identification and instructions for the best way to grow the plant. Wildflowers like daisies, poppies and baby’s breath grow well in most climates. If you have a green thumb yourself, you can plant seeds in small glass jars in advance and have starter plants to use as party favors and give away after the party. For a memorable birthday party for kids, there are favors they can make with an adult’s help. Too-small crayon stubs can be melted down and mixed to create multicolored, swirled crayons in fun shapes. Simply place crayon stubs in a cookie cutter on wax paper, heat until wax melts and use toothpicks to swirl colors. Candy or soap molds can also be used. Another easy favor begins with cardboard tubes from toilet paper or paper towels. Fill with candy, cover in wrapping paper extending a few inches beyond the ends, twist ends and tie with ribbons. Simple, festive and filled with candy: what’s not to love? When it comes to saving on party favors, the more creative you are, the more you save. How I wish you can include a complete ‘how-to’ next time! I just love DIY projects. Never tried to give away my own works but seems a brilliant idea to save up. My own recycled artworks are here at home as decorations. If you are indeed in a budget you can try buying stuffs wholesale as its much cheaper this way. You have awesome ideas, but I second the need for some great how to’s. I love the idea of making things from recycled found objects as it keeps costs down and helps the environment. Thank you for your ideas and more crafty things would be perfect on this blog! It’s definitely original & creative to do this. Reading your article gave me so many ideas and best of all .. it doesn’t have to cost much at all. I remember going to a party just before Christmas, and the host made small gift boxes in different colors and with nice decoration. Inside was a small card with a personal Christmas message and something to eat. Everyone was so happy with it. True. With a dose of creativity and resourcefulness, you will be amazed at the wide array of ideas and initiatives you can take to reduce your party expenses. You can try recycling your party decorations. You can also make your own giveaways. Try making a quick research over the internet on party giveaways you can make at a lower cost. 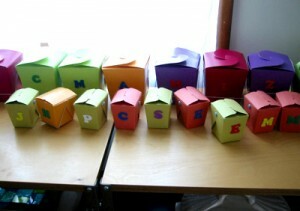 I’ve used the origami idea at a few events – for kids and for adults. Not only are the origami items unique, being hand made, but they are simply delightful. Each time I’ve used them I’ve had such lovely comments from the recipients. Once for a child’s party, instead of buying expensive party bags frull of expensive treats to be taken home – we made origami boxes and put and origami animal or bird in each one with some origame paper and instructions for making another animal and some home made sweets. The kids loved them – so did the parents. I love the seeds idea. You’re right it’s like a little reminder of the party that keeps growing and growing 🙂 – also on the picture I presume they’re initials on the boxes? Kids love anything personalised – especially if they’ve helped make it themsleves. These are good ideas for favors on a budget! However, if you’re not the do-it-yourself type this can be a bit overwhelming. I’m personally a big fan of the single item goody bag. Like a frisbee from the dollar store, a thing of bubbles, or a jump rope. These things encourage kids to be active, are really cheap, and are fun! I noticed that at the Dollar Tree they have really nice coffee mugs, teas ,coffee, cocoa and flavoring syrup for coffee. You could have party favors for adults that consist of a coffee mug with a couple of teabags, a packet of cocoa, a couple of individually wrapped cookies or a wrapped chocolate. You could wrap it in cellophane and tie it with a ribbon. PS, I had a thought that in keeping with the coffee theme of the gift mug, you could make chocolate dipped spoons, it’s just a plastic spoon dipped in warm chocolate- like Wilton melts or melted chocolate chips and then dipped in sprinkles. I love DIY party favors! I don’t know how many bags of goodies I’ve had to discard of with candy my kids can’t eat and cheap dollar store toys that break before the kids can even enjoy them. It seems like a big waste of money for the party host, and sends home a bunch of stuff you don’t really need or want. For my son’s last birthday party, he chose a Roly Poly Bug theme. It’s his favorite bug for some reason! Try reasoning with a almost 3 year old about the theme of their party…not worth the battle. I was wracking my brain and spending too much time online searching for decorations and party favors that would go along with his theme. Suddenly it dawned on me to DIY! The children ended up taking home a hand made terrarium (plastic container) with dirt, rocks and leaves (all free!). We added a piece of cut up potato and a small toilet paper tube cut in thirds for a tunnel for the bugs. Then the kids spent half the party hunting for bugs in my flower beds 🙂 I’m sure the parents were thrilled I was sending bugs home with them, but every single boy was happy to be covered in dirt and proud of their bug hunting skills. Turns out hand made party favors rock! I really like the suggestion for re-using baby food jars. Since I have a 9-month-old, I have access to quite a few of those. The plastic baby food containers (little rectangular boxes) would be good for party favors for kids. You wouldn’t have to worry about them breaking. I agree with previous posters that more detailed instructions or more photos would help this article. Thanks for the suggestions! For my son’s recent Postman Pat birthday party, one activity was drawing on a brown paper bag (kindly provided for free by a bottle shop!) which became their postie bag to hold things during the party. I wrapped their lollies in brown paper as a parcel to take home along with some printed colouring in pages. All cheap and easy. For Christmas favours, I’ve cut shapes (stars, bells, etc) from old cereal boxes and let the kids make them beautiful with textas, old wrapping paper, kitchen foil, etc. You get a colourful unique decoration to use at home, attach to plain wrapped gifts or give as gifts. I’m seeing so much potential for these! I really like the idea of having little jars of hot coco mix for wintery holiday parties. I think I will use some tin-foil to make snowflakes for some added decoration. This is very useful information for me, as I am a band leader and I plan to throw parties often. I see other band leaders spending way too much money on promotional materials, and there’s no way that I can keep up with them. I recently made about fifty labeled spice jars to give out at an upcoming band event. Unfortunately I don’t have a baby, and so I had to buy the jars, but I was able to save a lot of money by not having the company label the jars for me and doing it myself with printer paper and double sided tape. I’m absolutely going to use the origami idea for the packaging, too. Thanks for this.